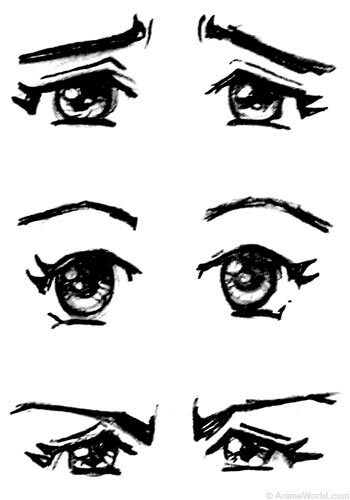 Eyes are maybe the most significant element of an "anime" or "manga" style of drawing (I would say that "big eyes" is what usually comes to mind for the majority of folks when they try to characterize what makes something "anime style"). As with all things, anime art is a stylized interpretation of the regular world, so it helps first-off to be familiar with what you're interpreting (that is, take a good look at a regular human's eyes). Unless someone is looking very wide-eyed, you don't see all of the iris (the colored part), and often not even all of the pupil (the black part). 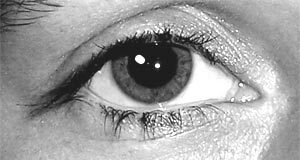 When looking straight ahead, the upper eyelid covers up the top part of the iris, and the lower eyelid comes to or slightly covers the lower part of the iris. Obviously this isn't the case if someone is looking down at their feet or something. The point is to remember that not so much of the white of the eye is generally visible. For the profile, note that the curve of an eye relates to the fact that eyes are spheres about the size of golf balls, but (unless you are some creepy, skinless zombie) most of them are hidden underneath your skin (thank goodness). It just depends on what feel/mood and style you want. If you don't have a personal preference of style, you can experiment with different techniques and look at the work of different anime and manga artists you like--see how they do it, and try their styles and mix and match different techniques to develop an approach that suits you. The shape of the eye conveys part of the emotion--narrower for angry or sad, wider for happy or interested, really wide for shocked or alarmed. The big thing, however, is the eyebrows--flat or rounded for happy, arched and high when surprised, pointing down with furrowed brow when angry or intense, and curving up for sad. It is pretty simple to convey emotion with basic differences in eyebrow shapes--just take a look at little internet "emoticon" smiley faces. You've spent your whole life looking at people's faces and expressions, so you are probably pretty good at groking which emotions cause which expressions, but, when in doubt, for ideas look at some anime or manga pictures, magazine or movie still photos, or just grab a mirror--emotion-induced facial expressions are pretty universal, so just make your own.